The Detective Pikachu movie will be finding its way to theatres in exactly one month's time, but that doesn't mean the constant trickle of footage is showing any sign of stopping. Yet another trailer has been released, this time directly from Pikachu actor Ryan Reynolds' personal accounts. You can see several new Pokémon really close up here, with the likes of Venusaur and Magikarp being shown off in a jokey casting video. Expect humour, cuteness, and 'oooh, that's weird' in equal measure. 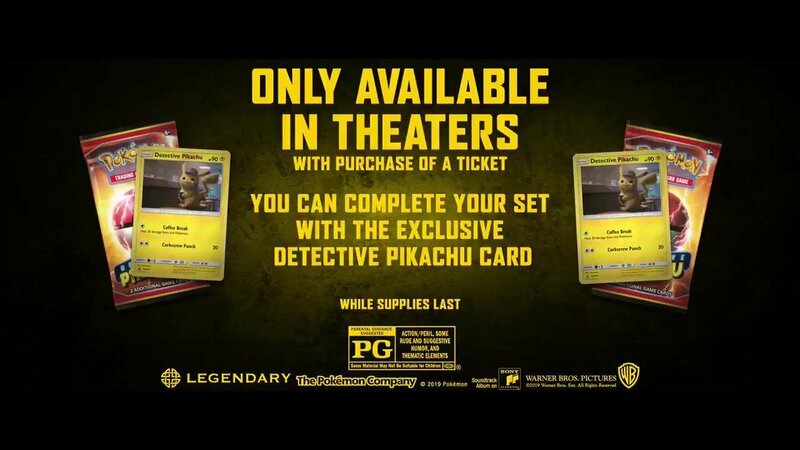 The end of the trailer also reveals that film attendees will receive an exclusive Detective Pikachu card (while stocks last). You can see it below. Will you be going to see this? Can we come? Let's make plans in the comments below. Squirtle is adorable, as usual. The movie doesn't deserve to look as good as it does. I'm seriously considering going to a theater to watch this one. Last time I've seen a movie in a theater must have been like... I dunno, in 2013? I'm not really a movie guy. I seriously can't wait for this movie. More hyped for it than I am Endgame and I already have my ticket to that. I have little to no interest in Pokemon but it’s fascinating seeing all these creatures we know so well like this! I hope the movie is good and finds an audience. I have to admit they won me over with this movie. I was hugely skeptical when it was announced. They all look good and Psyduck looks better here than any of the movie clips it's in. Aipom is nightmare fuel even though its in-game model is kind of cute. These Pokemon in Detective Pikachu look a little too realistic and uncanny for me... think I'll officially being passing on this movie. @Trikeboy You sound very upset that this looks good. I wonder if we'll see the Purrloin mug someone. A pokemon ate my dog. So I won’t be seeing this. It's funny. I've had no interest in going to the movies for the first quarter of this year, but between this and some of the Disney/Pixar, MCU, and DCEU films among other things, I'll be frequenting theaters more than usual. Can't help but think of Groot. Oh man, MAJOR flashbacks to childhood when I saw Pokemon: The First Movie in theaters and they were giving out Pokemon cards to the attendees. My inner ten-year-old was already excited enough to see Detective Pikachu as is. I can't believe I'm actually legitimately excited about a video game movie.... This keep looking better and better. This trailer was a good call. This looks good. Endgame eclipses it though. Now-a-days I only really got to the movies to see the MCU. Unpopular opinnion i know dont need to smash the dislike buttom on me. Nice. Most of those look really great. Why does this movie look so good? It shouldn't look this good. I didn’t watch this latest trailer as I would like to see the movie with the least amount of spoilers. Can't wait to see it! Also, can't believe I just said that about a movie based on a video game, they're usually bad, but this one might be the exception. Could actually turn out to be one of the best video game movies and will probably make a lot of money too. Great, more hideous abominations. I really can't believe so many people actually like these creations. Pokemon were never designed to appear alongside realistic humans and every time I see clips from this movie it is more and more clear that it doesn't work! @Heavyarms55 While I respect your opinion and see why some do not like it, I disagree. This might be the first pokemon movie I'll go watch in what seems like ages. Last one I saw was Pokemon 2000. @Arkay While it makes me sad to hear this movie is actually going to make money, I respect your right to use your money however you please. Make a game based on the movie based on the game. @HumanDog Actually this is a movie based on a game based on another game. What's up with Eevee's bowl cut? @Indielink Not at all. I'm very excited. Best/worst thing: Detective Pikachu alts in Smash for the Pokemon characters. Can't wait to see this. Every trailer gets me more excited!! That said, Eevee doesn't look so good.